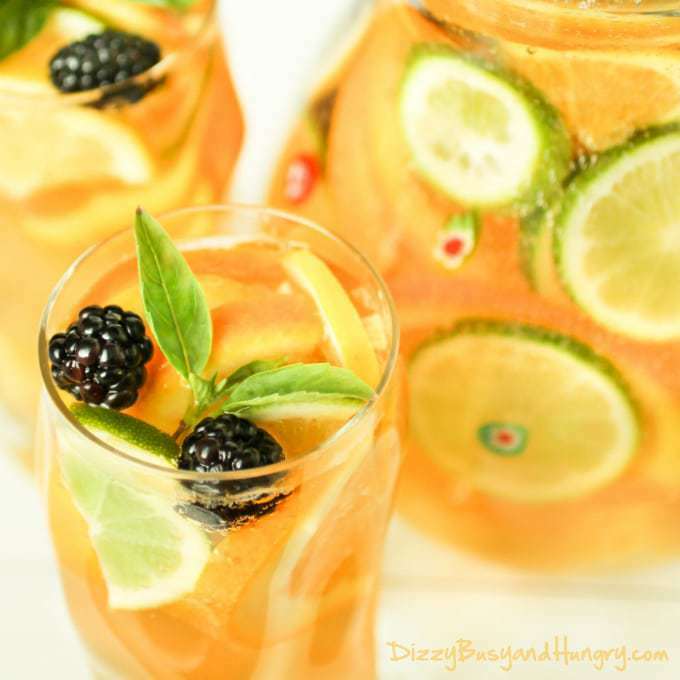 Sparkling Citrus Sangria | Dizzy Busy and Hungry! Summer is here! Hooray! To celebrate, here is a recipe for a refreshing and crisp adult beverage made with pineapple juice and ginger ale, perfect for a warm summer afternoon! Picture yourself sitting poolside, or on the beach, basking in the warmth of the sun and relaxing with a glass of this delicious sangria. That sounds like heaven to me! Pineapple juice and ginger ale add just the right amount of flavor pop, and the gin adds a little extra kick! It really isn’t a strong drink, but you can totally skip the gin if you are concerned about the amount of alcohol. You won’t even miss it. I added a few blackberries for extra color pop, but I wish I had gotten raspberries. I think a few luscious red raspberries would have been stunning! I will remember that for next time I make it (and there will be a next time, probably many of them!). I also placed some basil leaves for decorative purposes – they made the drinks look so fresh and summery! Refreshing and crisp adult beverage made with pineapple juice and ginger ale, perfect for a warm summer afternoon! Slice the fruit into thin rounds. Cut some or all in half if you wish. Place the fruit in a large pitcher. Pour the pineapple chunks and juice in the pitcher. Add the wine and gin and stir. Place the pitcher in the refrigerator for an hour or until ready to serve. Make sure the ginger ale is also in the refrigerator so it is cold when you add it. Right berfore serving, add chilled ginger ale. 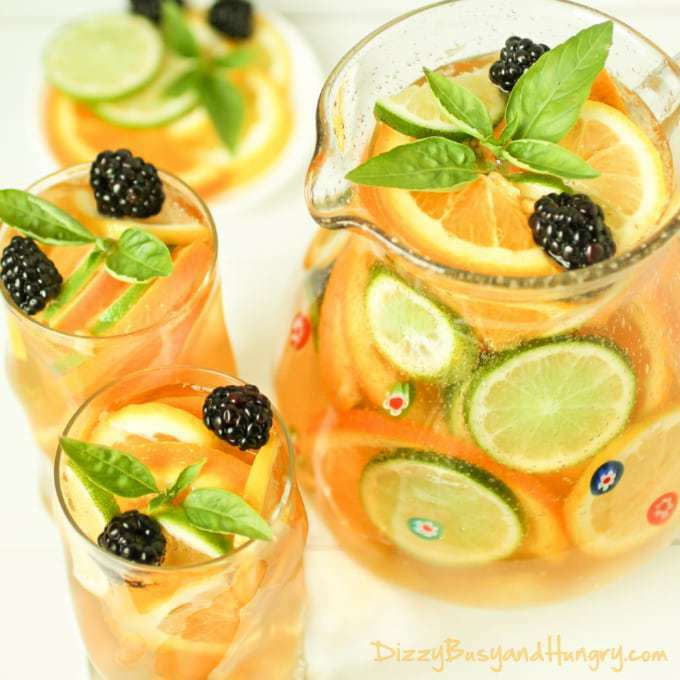 Serve with pretty-colored garnishes for a fresh, summery look! Sounds so so good. Ill definitely try this! Pretty and refreshing! Thank for sharing the recipe with SYC. This looks delicious and refreshing! Perfect for any time this summer! 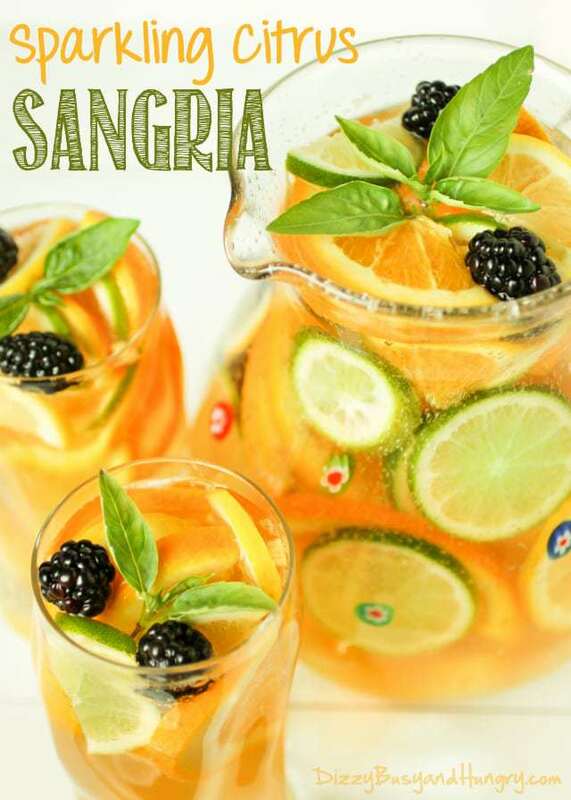 You had me at Sangria! Sounds so good with lemon, lime and pineapple. Def pinning this to make ASAP! Hello! We’d love to join your Cocktail Concoctions board. We make all-natural liqueurs and focus on simple cocktail recipes with unique, yet approachable flavors. Wow! What a beautifully impressive looking cocktail, and how easy it is to put together. I just love that! I for one really like the contrast the blackberries add! And pineapple and ginger is such an amazing combo! I didn’t used to like gin, but a couple of years ago something changed and now I love that light peppery taste it adds to drinks! Can’t wait to try it! This looks so delicious! I love a good sangria! I’m used to berry sangrias, but I’ll definitely have to try this one day!